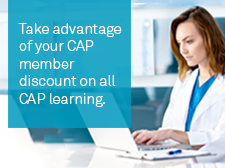 Thank you for your continued membership and support of the College of American Pathologists (CAP). If you are not yet a member, find out more about CAP Membership. Disclaimer: Only CAP members may contribute to PathPAC. Personal contributions made to PathPAC are voluntary and do not affect your CAP membership. PathPAC contributions are not deductible for tax purposes. Federal law requires PathPAC to make its best effort to report the name, address, occupation, and employer for each contributor whose aggregate contributions are in excess of $200 per calendar year. Only U.S. citizens or those holding a green card may contribute to a PAC. Individuals may contribute up to $5,000 per calendar year to PathPAC. Disclaimer: PathPAC accepts corporate contributions for the Political Education Fund (PEF), a non-federal account supporting CAP political and legislative programs. Disclaimer: Contributions to the CAP Foundation are tax deductible to the extent permitted by law as charitable tax deductions. Disclaimer: No portion of your dues is deductible as a charitable contribution. The estimated portion of the CAP dues allocable to lobbying activities and not deductible for federal income tax is 35%.